Looking for something new to do with little Londoners? Top Sights Tour has an adventure in store, a Shrek Adventure! Join us on our historic London walking tour where you will see the top 30 London Attractions plus an interactive Shrek adventure that’s sure to please the whole family! Take a journey to Far Away Land’ says the slogan for London’s shiniest new attraction based at Country Hall by the River Thames. 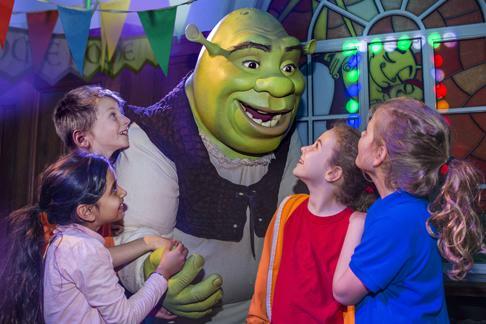 Shrek’s Adventure London is a walk and ride experience for the whole family beginning with a 4D bus ride, followed by DreamWorks animation, story-telling and audience participation. Shrek’s Adventure offers a unique walk and ride attraction for the whole family. Step into the kingdom of Far Far Away and enjoy a brand new madcap Shrek adventure where amazing DreamWorks animation, captivating story-telling and a good dose of Donkey’s cheekiness awaits. The adventure begins when you board a magical 4D ‘DreamWorks Tours’ bus. With Donkey as your mischievous tour guide, calamity, chaos and endless fun are the name of the game. Be part of the 10 live fairy-tale themed shows where you can visit Shrek’s swamp, find your fortune in the crystal ball, get lost in the Mirror maze and reveal your inner Ogre when needed! On thing that’s great about Shreks adventure is that it is all about audience participation! From the moment you enter the attraction you are thrown into the experience as you wait to enter the ‘departure lounge’ to Far Far Away. The staff are great at getting everyone into the mood and their enthusiasm was infectious. With little features like the stream of different funny messages over the tannoy, the X-ray Machine, Lost & Found and even a surprise appearance from everyone’s favourite biscuity friend on the lift journey up to the first floor, and plenty of surprises on your journey, there is never a dull moment! A brilliantly bonkers interactive and immersive walkthrough experience, where the whole family can step into and star in your own hilarious misadventure with Shrek and his DreamWorks friends. See, hear, touch and smell the adventure by exploring 10 fairytale themed live shows, collecting the special ingredients that you will need in order to find Shrek and make it home safely!